Call in advance to confirm availability. There are numerous conductive outlets at Real Goods Solar Living Center in Hopland, including a 14-50 and some 120V outlets, all for charging EVs. 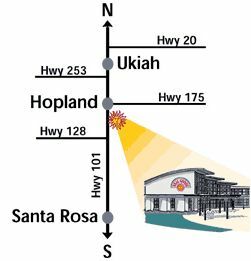 The Solar Living Center is located 95 miles north of San Francisco on Highway 101, approximately a two hour drive from the Bay Area. Generated on Sunday, 1/30/2011, at 10:44:57 PM PT from evcnall.fp7. 5/23/04: Adjusted lat/lon per Chuck Hursch. 9/1/03: New site added, per Nick Carter.